A Crunchy Baby Registry – Play: things you NEED (or should make) before baby comes. An alternative baby supply list for frugal moms, hippies, poor people, and mothers of oopsies. This should have a washable cover. You can get the cheapest, no-frills one you can find. They’re just about all the same, almost all of them have soothing vibration. I have one with fish hanging off of the toy bar above, and the newborn really likes to kick the fishies. This is for you to tote around, or leave in the bathroom so you have somewhere to put the baby while you pee. Maybe even get a shower. Never put the baby up on anything when she is in anything, not the bouncer, not the car seat, not Bumbo. Not the table, not the couch, not the counter, not the bed. Always be gentle and careful with your baby. You are just asking to drop your kid on her head. Baby heads are fra-gi-le (pronounced to rhyme with Chile, like on The Christmas Story). This is very important gear. It should have a washable cover (this should be a given but isn’t, you have to check). Most of them have bells and whistles like music and a mobile, some have lights and/or motion. Some are much shorter and look less cluttered, some are as tall as the old school swings. This should have an ac plug. You can go through three D batteries in 48 hours when the kid is super cranky (crying and fussiness peaks at six weeks). If you invest in rechargeable batteries it will save you money in the long run, but either way it will get expensive. I paid more for the rechargeable batteries than I did for my cradle swing at the thrift store, and I’m still looking for a swing that plugs in. 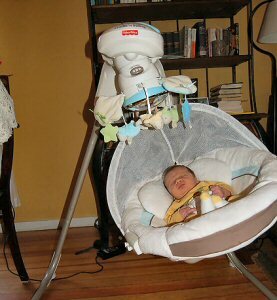 A cradle swing will be good until 25 pounds, around 19 months for the average baby. No baby gear should be a babysitter, but you do need something. Even if you are a fan of babywearing, I suggest this be the one thing you buy to have somewhere to put her. If you have zero dollars then this can also double as your crib, or I’ve known people to use a drawer lined with a blanket in the bedroom. I would love a cosleeper, but never managed to find a used one cheap enough. The wonders of this contraption are obvious when you hit the period of purple and the kid just won’t stop crying. Extra Tip: Period of Purple Cures: First check the top reasons babies cry: hungry, diaper, tired, needs cuddles, tummy troubles, burping, too hot/cold, teething, over stimulated, bored, sick, something scratching or wrapped around somewhere. Then try the 5 S’s of soothing: swaddling (http://www.parenting.com/gallery/how-to-swaddle-a-baby?pnid=110013), side/stomach position, shhhh/white noise, swinging, sucking. Then stick the kid in the swing and walk away for a minute and see if she puts herself to sleep. Find the money for these. Keep track of what your gear needs as you get it (you can just make a note in Outlook, or a sticky note somewhere you won’t lose it). You need to invest in rechargeable batteries. They are expensive to buy, especially the Cs and Ds. But you get 100s of uses out of a rechargeable battery, NiMH batteries have thousands of recharges. It is $5 each to buy a rechargeable D battery, about $1 for a regular D battery. After the 5th charge, the rest of your hundreds/thousands of uses are free! It saves you money in the long run. Big box stores are spotty on having the larger ones in stock, but you can get them online, including on the big box stores’ sites. Extra Tip: DO NOT mix types of batteries in devices or chargers (NiMH, NiCD, NiZN, alkaline…). You want both a big charger for the Cs and Ds, and a smaller 15 minute charger that will zap the double and triple As for you. You are unlikely to find these used anywhere but eBay. There are a ton of items that are available to distract the child. There are mobiles, soothers, wall mirrors, crib toys… I recommend a soother that has music, lights, and a ceiling projector. You don’t need all that stuff. 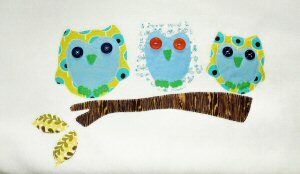 You can get some butterflies or a wind spinner from the dollar store and hang those above the crib (securely). However if you’re going to buy something get all the bells and whistles. You’re going for the most bang for your buck, if you’re going to spend the money make it count. I hate the mobiles you have to wind, with kid #1 I always always had to wind it repeatedly. Battery powered music works better for me. With kid #3 she absolutely loved the ceiling projector, the music wasn’t too exciting but she would immediately still for the projector. I got soothers for two of my kids at yard sales. Are you willing to pay the big bucks for the “natural” toys, do you buy all the latest, or do you prefer to just give the kid a cardboard box?